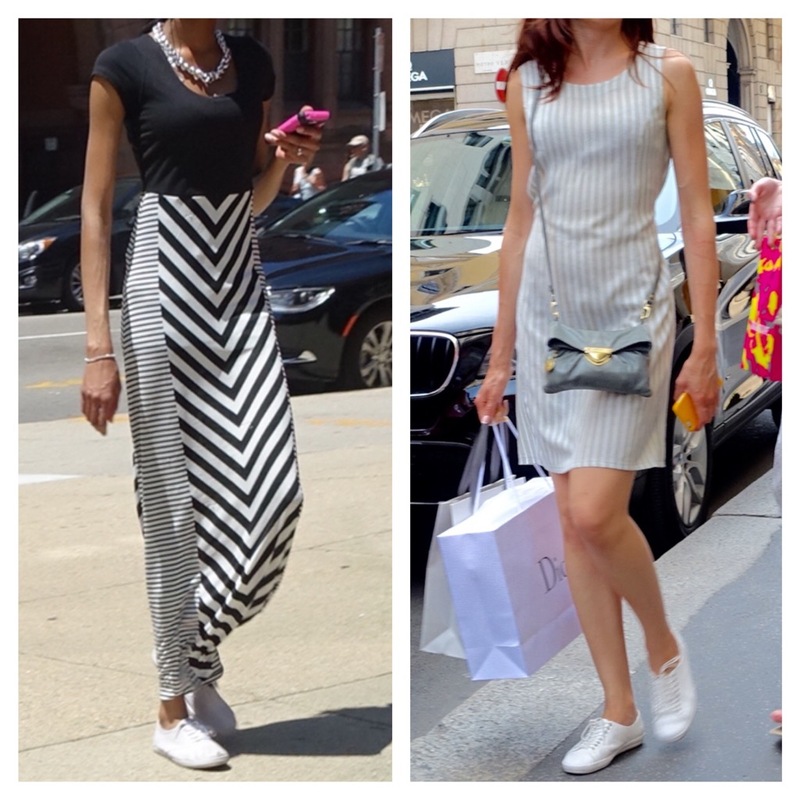 Have you thought lately of wearing a dress with sneakers? Now I am not talking about sneakers for walking to the office where you slip on dressier shoes. In fact, I trust you use a pair of cute flats for that purpose anyway. Our first muse is modeling – of course! – Chuck Taylors, that iconic sneaker which looks great with dresses of varying hem-lengths. DO wear a maxi dress with Chucks! In an earlier post, the topic was how to – and not to – wear Converse. In a nutshell, the dresses which work best are flirty mini dresses, sheath dresses, and maxi dresses. Wearing a black or neutral-colored dress with Chucks in a popping color or wearing a bright, multi-colored dress with a monotone pair are winning combinations. I love the studded Chucks on the muse above! 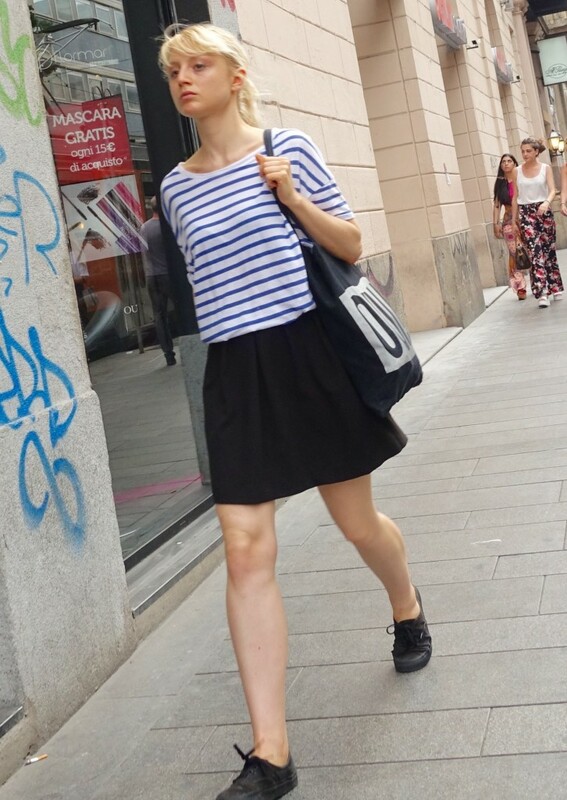 Please DON’T wear a ladylike dress with delicate-looking neat white sneakers! I have to say that I am a firm believer that sneakers ought to be treated like sneakers – an element of contrast, for example, with more delicate attire. Otherwise, instead of simply looking dainty like a pair of ballet flats, they give off more of an aura of orthopedic nurse’s shoes. 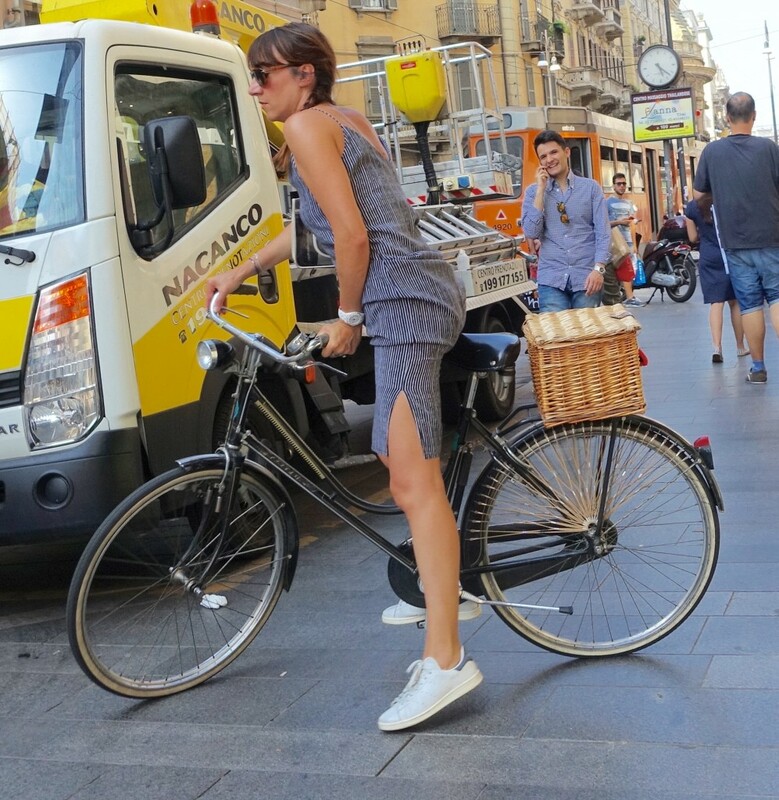 For those of us who are not the tender age of these muses, delicate white sneakers with ladylike garments can also carry the vibe of a much older (and not so stylish) woman. DO wear a black and white outfit with stylish all-black sneakers! After I had knee surgery a couple years ago, my surgeon insisted that I wear sneakers during recovery. Since I also wore a lot of dresses, I was mortified. Fortunately, my fiancé recalled finding super cute all-black Pumas for his college-aged fashionista daughter. A similar pair served me very well, although today, I would definitely opt for a more current, androgynous style, like the one pictured above. These sneakers also pair adorably – I’ve noticed – with a white tee and black cotton jersey pencil skirt. especially if you have the gams of this New York muse (above). When I originally wrote this post, it was a “Don’t”. I’ve finally come to my senses though – this is fashion-forward! And the woman wearing it is a prime example of New York edginess. DO wear bright neon-colored sneakers with a bright-colored above-the-knee frock! I saw several successful examples of this in Milan, among women of all ages. With this formula, you can shave hours off your search for the perfect comfort shoe for that trip abroad. And instead, you can spend some of that time more pleasurably, picking out a few lovely dresses like the one above. Just please – especially if you are American – make sure that you avoid wearing those same sneakers with jeans (donning that hideous snean ensemble)! Androgyny seems to be growing in popularity, but what I find the most fun is blending opposites. That is why I’m hoping this post has given you some fun ideas to play with dresses and sneakers or at the very least, some alternatives for any of my dear readers recovering from knee surgery. Thank you, Carmen! I also love that combination. ??? ?